Click the button below to add the Generac 7029 9kW Guardian Generator with Wi-Fi to your wish list. NEW 2018 WI-FI MODEL (SAME AS MODEL 70291). The Generac 7029 is run by the Generac G-Force Engine. This engine is strong and stable, capable of handling strenuous use, is pressure-lubricated, and requires less regular maintenance than most engines. It operates at 62 Decibels, making it a quiet electricity solution for homeowners. The 7029 is Wi-Fi capable. This model features Generac’s Evolution™ Controller. This LCD display monitors the battery and maintenance schedules, and operates with multiple language options. 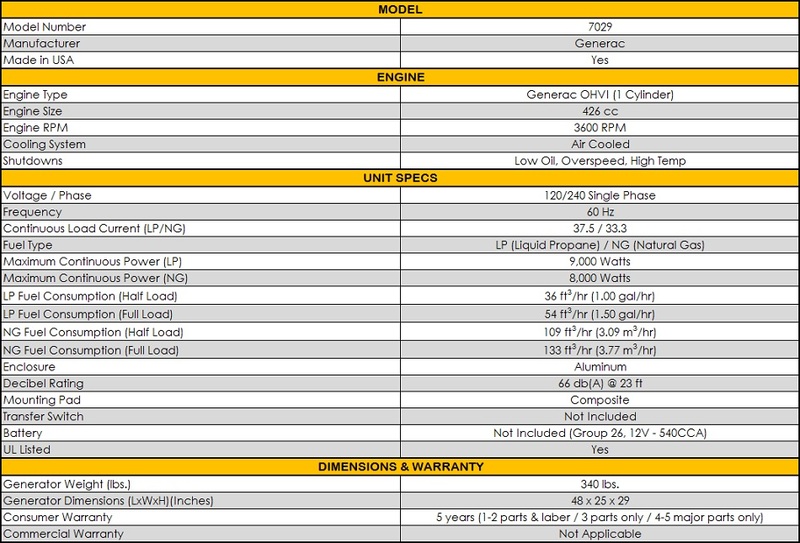 The Generac 7029 comes with a 5-Year Limited Warranty. *This model does not include a Transfer Switch. The new Generac 7029 9/8kW Air-Cooled Standby Generator has the reliable Generac power to keep you running when it matters. It offers the electricity you need during an outage and protects your home’s circuits. It is also more affordable that the usual central air system and runs quiet, clean power to the house for an overall excellent backup electricity solution for your home. The 7029 is powered with the Generac G-Force engine—a powerful engine capable of handling significant use. This type of engine is pressure lubricated and does not have to be maintained as much as many other types. It is 48” in length, 25” in width, and is 29” long, and weighs 399 pounds. Its wattage is a maximum of 9000 LP watts and 8000 NG watts. This generator model does not include an Automatic Transfer Switch, but still provides plenty of backup power. It’s a quiet power solution with a noise level of only 62 Decibels; any homeowner worried about residential noise rules can rest easy. This powerful generator can supply electricity to the home’s essentials. The Generac 7029 9/8kW Air-Cooled Standby Generator also offers more gentle, cleaner power. This is due to True PowerTM Technology—a feature that manages harmonic distortion, reducing it to no more than 5%. The result is electricity that even sensitive appliances can handle. The 7029 also operates with technology that makes it a modern option and enhances its reliability. The Mobile LinkTM Remote Monitor—sold separately—is an element that lets the homeowner monitor the generator from anywhere and any device that has internet access. With wired or wireless service and a smart device—tablet, smartphone, computer, etc.—the owner can see the generator’s status and more. Additionally, this generator has Generac’s Evolution™ Controller; it keeps an owner apprised of battery and maintenance statuses. It can also be read in several languages. In addition to technology that helps you maintain the unit, this generator has an Aluminum Enclosure and RhinoCoat powder-coated finish to help protect it during storms and other types of damage, such as long-term problems like corrosion. It can even withstand winds of 150 mph. Generac takes pride in their generators’ constant power and reliability. The generators and engines are built in the USA, and Generac provides constant customer service—24/7, all year. This particular model has a 5-Year Limited Warranty to help make sure your power investment lasts. Not much to say. Works as expected and we love our insurance policy in the event of a power outage which happens several times a year in our neck of the woods. Best price we found. They even through in a free battery. Wow. I am just amazed on how well this Generac 9kW performs. You hope you never have to use your generator. Well we experienced our first power disruption since installation. I was amazed at how quickly power was restored. We bought a smaller generator as we did not think we really needed everything powered back up if the power went out. It was so nice to have the essentials powered back up my only regret is we did not buy a bigger generator so we could have a had a few more things powered back up. It was definitely worth the investment. This Generac 7029 generator was on backorder from the manufacturer. AP Electric did a great job on keeping me informed of the situation. Pleased with the purchase. I am just powering up the essentials and this generator will work perfectly for that.